This is Anne-Marie’s first appearance at the New Vic. Theatre credits include: Day of the Living (RSC); Love’s Victory (Penshurst House); These Trees are Made of Blood (Arcola Theatre); Sonnet Walks (Shakespeare’s Globe); Wicker Husband (The Other Palace); A Scarborough Christmas Carol, Pinocchio (Stephen Joseph Theatre); A Well Remembered Voice (Leicester Square Theatre); Much Ado About Nothing, Richard III (Iris Theatre); Macbeth (Southwark Playhouse); A Christmas Carol (Rose Theatre); The Snow Spider (Ovalhouse); Treasure Island, Alice in Wonderland (Nuffield Theatre); Beauty and the Beast, Oh! What a Lovely War! (Haymarket Basingstoke); What Every Woman Knows (Finborough Theatre). Film credits include: Strings and Mortar, The Promoter. Radio credits include: The Archers, Henry IV Part I & II (RSC), Man in Black, Faust, I Believe I Have Genius. 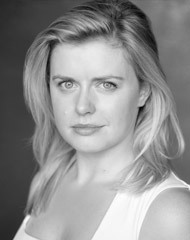 Anne-Marie trained at The Bristol Old Vic Theatre.